On Thursday, Representatives Jayapal (D-WA), Ellison (D-MN) and Dingell (D-MI) announced they will be co-chairing the new Congressional Medicare for All Caucus. This caucus will have significant impact. They’ve already brought on 70 members of Congress as founding members, and if the national conversation around the issue is any indication, they’ll keep adding more as time goes on. A few years back, I started asking questions about why, year after year, my company’s health insurance plans got more and more expensive – increasing by double digit percentages year after year. That question led me down a rabbit hole, I learned more about how our overly commercialized health care system is designed, how its supply chain complexity masks huge profit centers, like insurance companies and pharmacy benefit managers that add little value while wasting our time and precious dollars, how we have the most expensive system in the world with worse health outcomes, how we are the only country that depends on employers to provide health insurance to a large portion of our population, and the only one that relies on for-profit insurers to finance our healthcare system, how we pay twice as much for prescription drugs, and how the average doctor will spend tens of thousands of dollars every year dealing with insurance companies. Then, I began to study the way other developed countries were designing their health care systems. I’ve been in business for decades, and as a CEO it’s my job to understand how to create efficient systems that deliver a high-quality product at low costs. It wasn’t long before one thing became painfully obvious to me: the only way we can have universal health care at low cost is Medicare for All. Ever since, I’ve been advocating for it non-stop. I created documentaries about how health insurance and pharmaceutical companies, along with their huge lobbying budgets, are decimating our healthcare system and economy. I founded the Business Initiative for Health Policy to tell the story of how our small and mid-sized businesses are crying out for relief from our employer-based system. There’s no question that our healthcare system is broken, but for a long time, it’s often felt like I’ve been screaming into the void. However, recently things have changed. Public opinion is shifting as healthcare costs continue to rise. More and more candidates are winning elections running on Medicare for All, and now, 70 members have signed on to the Medicare for All caucus. To an advocate like myself, this is a huge step. Just a few years back, having a caucus of this size behind this issue would have been unthinkable. These high-profile elected officials, including Representative Dingell, who is not one of the “usual suspects” around Medicare for All, will be able to bring others into the fold and educate themselves and other elected officials. The members of this caucus are showing that their dedication to universal health care is more than skin deep. They are showing that they are willing to learn about patients, doctors, and business owners like myself, who struggle to keep up with rising costs. They’re show they are willing to fight for patients who are being forced to face both illness and bankruptcy at the same time. Most importantly, they’re showing that more and more, Medicare for All is becoming a platform issue, and that it is a politically viable answer to the health care debate. This is a huge step for supporters of Medicare for All, and shows that the discussion around health care has been permanently changed. Richard Master is the CEO of MCS Industries, the Founder of the Business Initiative for Health Policy, and the producer of several documentaries about the health care industry. The Business Initiative for Health Policy (BIHP) is an independent, non-partisan policy, public education and advocacy organization focused on advancing the business and economic rationale for the United States, the only developed nation without guaranteed universal healthcare, adopting a Medicare for All system. Join us to help our efforts in creating a healthcare system that works for all. The alarming complacency of Trump administration officials is not shocking. 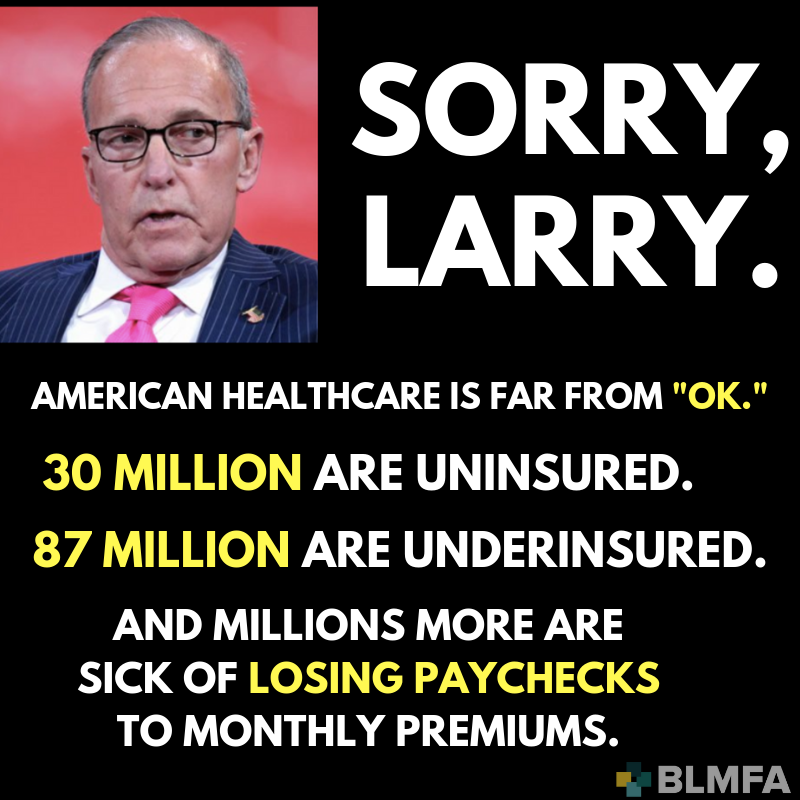 Larry Kudlow is already on a government-run health plan! If you really want supplemental insurance to cover cosmetic surgery, that's fine, but we have to build a #MedicareForAll system with universal, comprehensive coverage for healthcare needs.